When your heart is broken, how do you cope? According to many who lost their loved ones when the World Trade Center was attacked, it is their faith. ZENIT was at Ground Zero when Pope Francis visited this morning and had the chance to speak with relatives and friends of those killed in the attacks. Brendan Grady, who lost his brother Christopher, a trader for Cantor Fitzgerald, said it was an honor for Pope Francis to be at Ground Zero to remember him. “I can’t imagine my life without my faith,” Grimmer said. One man, before the Pope arrived, spoke to reporters about how he had lost his daughter who was a flight attendant on one of the planes that hit the tower. He lamented that she wasn’t supposed to work that day, but was covering for someone sick. Matthew Sellitto also reflected that the Pope is an image of goodness, and what happened here, 14 years ago, is the image of evil. Another man lost his sister, Deborah, in the Pentagon. 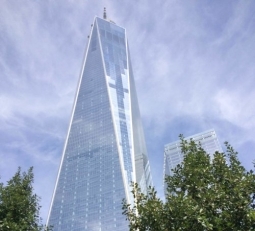 As he and his wife conversed with us, the man’s wife pointed out on her smartphone how the reflection on the Freedom Tower was that of a cross, and indeed, it was. Another loved one of a lost family member, who asked to remain anonymous, told me, “It has been a very significant day for me. Pope Francis is coming here with a message of joy,” she said.